Île de Gorée (also known as Goree Island) is a small island located just off the coast of Dakar, Senegal's sprawling capital city. It has a convoluted colonial history and was once an important stop on Atlantic trade routes from Africa to Europe and the Americas. In particular, Île de Gorée has earned itself a reputation as the foremost place in Senegal for those wishing to learn more about the horrors of the slave trade. Despite its proximity to the Senegalese mainland, Île de Gorée was left uninhabited until the arrival of European colonialists due to a lack of fresh water. In the mid-15th century, Portuguese settlers colonized the island. After that, it switched hands regularly - belonging at different times to the Dutch, the British and the French. From the 15th to the 19th century, it is thought that Île de Gorée was one of the largest slave trade centers on the African continent. The horror of the island's past has faded, leaving behind quiet colonial streets lined with the impressive, pastel-painted houses of erstwhile slave traders. The island's historic architecture and its role in enhancing our understanding of one of the most shameful periods in human history have together granted it UNESCO World Heritage Site status. The legacy of those that lost their freedom (and often their lives) as a result of the slave trade lives on in the island's somber atmosphere, and in its memorials and museums. As such, Île de Gorée has become an important destination for those interested in slave trade history. In particular, a building known as the Maison des Esclaves, or House of the Slaves, is now a place of pilgrimage for descendants of displaced Africans who wish to reflect upon their ancestors' suffering. The Maison des Esclaves opened as a memorial and museum dedicated to the victims of the slave trade in 1962. The museum's curator, Boubacar Joseph Ndiaye, claimed that the original house had been used as a holding station for slaves on their way to the Americas. It had served as the last glimpse of Africa for more than a million men, women and children condemned to a life of slavery. Because of Ndiaye's claims, the museum has been visited by numerous world leaders, including Nelson Mandela and Barack Obama. However, several scholars dispute the house's role in the island's slave trade. The house was built towards the end of the 18th century, by which time the Senegalese slave trade was already in decline. Peanuts and ivory eventually took over as the country's major exports. Regardless of the site's true history, it remains the symbol of a very real human tragedy - and a focal point for those wishing to express their grief. Visitors can take a guided tour of the house's cells, and gaze through the portal still referred to as the "Door of No Return". Île de Gorée is a haven of tranquility compared with the noisy streets of nearby Dakar. There are no cars on the island; instead, the narrow alleyways are best explored on foot. The island's eclectic history is evident in the many different styles of its colonial architecture, while the IFAN Historical Museum (situated at the northern end of the island) gives an overview of regional history dating back to the 5th century. The beautifully restored church of Saint Charles Borromeo was built in 1830, while the mosque is thought to be one of the oldest in the country. The future of Île de Gorée is represented by a burgeoning Senegalese art scene. You can buy the work of local artists at any of the island's colorful markets, while the area near the jetty is filled with authentic restaurants known for their fresh seafood. Regular ferries depart for Île de Gorée from the main port in Dakar, starting at 6:15 am and ending at 10:30 pm (with later services on Fridays and Saturdays). The ferry takes 20 minutes and if you want to, you can book an island tour from the docks in Dakar. If you're planning on making an extended stay, there are several affordable guesthouses on Île de Gorée. Recommended hotels include Villa Castel and Maison Augustin Ly. 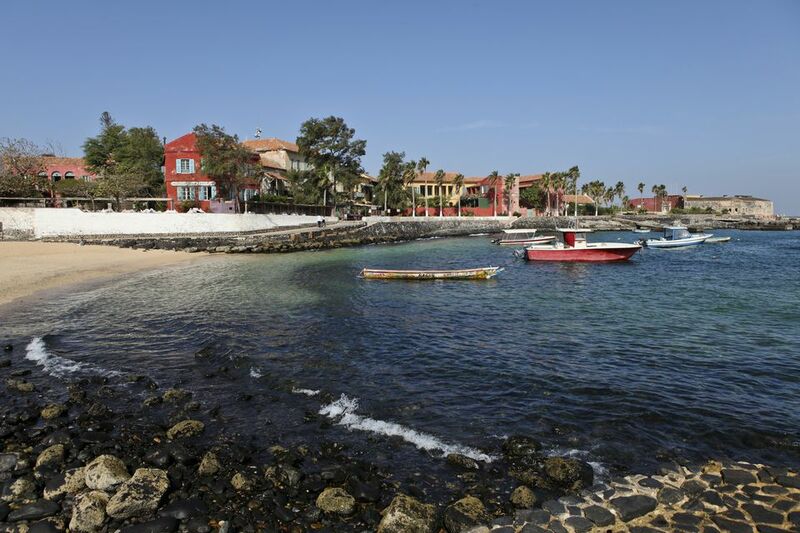 However, the island's proximity to Dakar means that many visitors choose to stay in the capital and make a day trip there instead.